It wasn’t pretty, but in the 126th meeting between Barnstable and Falmouth, it still tasted oh-so-sweet for the visiting Red Raiders. 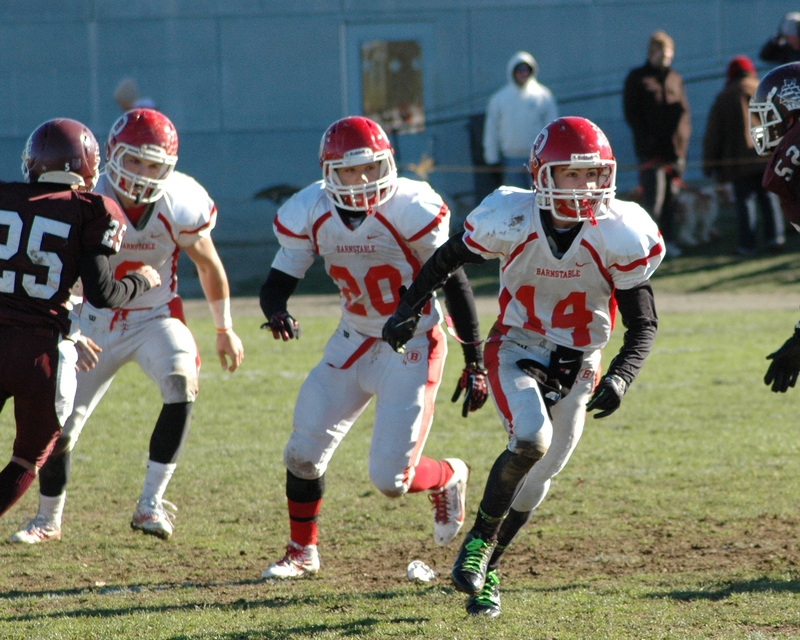 Barnstable scored early in the first quarter on a Colby Blaze 57-yard touchdown reception from Kristian Lucashensky (8-15, 213 yards, 3 TDs) and that would be all that the Red & White would need on Thanksgiving Day. Barnstable led at the half, 34-0, and then taked on two scores from Justus Chaffee and a 30-yard fumble recovery returned by Blaze, his second of the day. Other touchdowns were scored by Derek Estes (44-yard reception), Henry O’Shaughnessy, Mike Bilodeau and Hayden Murphy. Derek Pacheco tacked on five PAT kicks to round things off. Clyde Perry added an interception on defense.